My father brought my BMW 320d into you on Thursday to receive the TerraClean service. Since the car was returned to me I have noticed a difference right away. The engine is much quieter and smoother throughout the rev range but the biggest difference is how quiet the engine idles now. I had always thought this was a particularly noisy diesel by today's standards but the TerraClean service has rectified this. The other difference I have noticed is improved responsiveness particularly in the lower rev range. The car now responds below 2000rpm with the lightest of throttle whereas before I had to apply more throttle to accelerate beyond this. I can’t comment on the fuel consumption yet but I am sure there will be an improvement as you can appreciate given the other results i have experienced. Thank you for a good job well done. Just had TerraClean treatment carried out on this …. Just to let you know after the TerraClean treatment the car feels a lot more responsive in acceleration, not that it was sluggish before but there is a noticeable difference also the car feels very smooth, couldn’t really comment on the fuel consumption, think it has improved a bit but that’s not really what the cars about. I would recommend this treatment to others. Thanks for the professional service carried out. I have mentioned to a couple of friends so far about the system, hope you do well with it and get a lot more business and people coming in to get the system used on their cars. Just a quick email to let you know about my car. 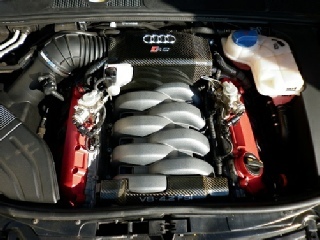 Was in on Monday and got my Audi S6 5.2 V10 done. What a difference, just filled up the car and worked out I got 110 miles more out of the tank. Throttle response much better too.